We know; today is going to be rough. Ever since the 1970 Buick GSX 455 robbed the Judge edged out the other the other three GM big blocks for a spot in our Fantasy Garage there have been howls for 440 Six Packs, 426 Hemis and general Mopar R/T madness. Well friends, today is your feast. As always, caveat emptor, for we only have 50 parking spots in this Garage of ours. As worthy as both these mad machines are, only one is getting in. Since our first introduction to each car was via celluloid, we thought we'd employ the magic of Hollywood to plead each car's case. Yeah, exactly, we're talking Bullitt and Vanishing Point. Hey, it worked for the 450SEL 6.9. One final point, we know we're leaving out the 'Cudas. And we're sorry. In the mid-1960s the Dodge boys had to stand aside and watch as Pontiac sold tens of thousands of GTOs. Not surprisingly, Dodge dealers were pissed. Chrysler President Lynn Townsend (the man behind the Pentastar) called Dodge's chief engineer Burt Bouwkamp into his office and demanded a solution, adding, "for God's sake don't make it a derivative of the Barracuda." Bouwkamp and his team followed the order and in 1965 presented the Charger II Show Car. If the public liked it, the thinking went, Dodge would build it. As Bouwkamp said, "It was pre-ordained that they would like it." Dodge went on to build the Charger, selling 37,344 in six months. However, added competition from the Chevy Camaro and Ford Mustang saw total sales for all of 1967 drop to less than 16,000 units. A redesign was ordered. The resulting car was the 1968-1970 B-body, quite simply one of the baddest looking machines ever built. While the previous version had all the right go-fast stuff (including the introduction of the 426 Street Hemi) it looked frumpy. Not so for the new model, as Dodge's stylists knocked the sinister-look ball out of the park and into the next millennium, where the car continues to blow minds and take numbers. That's owed to its seductive double-diamond or "coke bottle" styling, where the body bulged out at the front and rear quarters. Think about it: how much time did you spend as a child fondling a Hot Wheels General Lee? We bet a lot. Like all great muscle cars, the Charger didn't just look hot, it frigging flew. Power came from a variety of engines, but only two matter in today's context: the please-mod-me 440 Six Pack Magnum and the 426 Hemi with its insane compression ratio straight from the factory. We know the Hemi had the power advantage (supposedly), pulling 433.5 horses on the dyno in 1965 (the factory claimed 425). but Bill Hickman, the baddie in Bullitt, hooned the 440. Long story short, we wish we had tough decisions like this in front of us nowadays. How does this sound — if the Charger R/T makes it into the Garage, just imagine it comes stuffed with your favorite engine, as it really don't matter. And if you like, just debate it in the comments. I was really impressed with the Mustang after I got done with it. I didn't think it'd make that much difference beefing it up. Later, we took both cars out and went playing around with them over by Griffith Park (near Los Angeles). The Dodge, which was practically stock, just left the Mustang like you wouldn't believe. The Charger ran rings around the Mustang. We trimmed the tires down (on the Charger), we practically made them down to bicycle tires to try and handicap Hickman, and Bill just run them. But on the other hand, you have the Challenger. For half a decade Dodge dealers had to bend over and take the fact that Ford was selling millions of Mustangs while they had no pony car whatsoever. To compound the injury, Chevy had its Camaro, Pontiac had the Firebird and even cousin Plymouth was raking in the youth market duckets with its Barracuda. Hell, even Mercury had the Cougar. All of that changed in 1970 when Chrysler, saving (maybe) the best muscle car for last, green-lighted a Dodge version of its new E-body chassis. And man oh man, was a legend ever born. Like its big brother Charger, the Challenger was available with a raft of engine choices, but again the only two we care about are the 426 Hemi and the 440 Six Pack Magnum. Same power, too, but the smaller Challenger was lighter and more nimble. Performance, for the time, was massive, with zero-to-60 times right around six seconds and the quarter-mile happening in the mid 13s. And with decent tires, the times dropped. The Challengers looked the part, too, with their sleek snouts and bulging, slightly jacked up haunches. Designer Carl Cameron actually borrowed the design for the grill from a sketch of a '66 Charger he drew that was to be turbine-powered. We love that. But you just can't talk about think about the Dodge Challenger without a close examination of Vanishing Point and the car meant to the film. For those who haven't seen the Barry Newman original, slap yourself. Then, bookmark this page, go rent it then watch it. Finished? Good. And now you know that for no reason other than the fact that he can do it, Kowalski jumps into his white "supercharged" Challenger and decides to drive from Denver to San Francisco solo in 15 hours. While hopped up on goofballs. Why did you climb the mountain? Because it was there. For years the rumor mill has prolifically churned out all sorts of speculation as to what exactly Kowalski was driving. For certain it was a white Challenger with a Hurst four-speed. One camp maintained that there was in fact some sort of special, also hopped up, supercharged Mopar mill under the hood. Sadly, that's just not so. 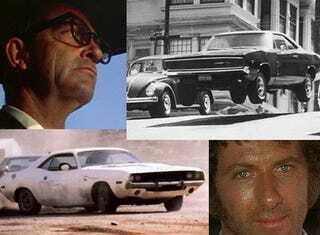 Vanishing Point featured five different Challengers (and a doomed Camaro!) in the role of Kowalski's ride (though oddly at one point Newman claimed there were nine cars). Four had 440 Magnums, while one had a 383 with a three-speed slusher. Many people (me nearly included) consider the chase scene in Bullitt to be the greatest ever. However, where Bullitt is only an — admittedly — good movie that just happened to feature an eye-popping chase sequence, Vanishing Point is nothing but a car chase. And, paradoxically, anything but a car chase. America was near the bloody end of the Vietnam War and the young not white privileged enough to get a college deferment were being drafted and slaughtered in an essentially meaningless old man's war. At the same time the politics of the day seemed hopeless and the idealism of the 60s had crashed and burned. Vanishing Point then, was an expression of disgust, a shot across the bow of the status quo. With car as metaphor. And of course, the car chosen to vent this rage was the mighty Challenger. Kawolski's ticket to ride, man. However you end up voting, you're picking a hell of a car whose Fantasy Garage credentials are unimpeachable. And just because Vanishing Point moves me into the realm of existential bliss/terror, I don't want to take anything away from the poetry of Bullitt and the righteous Charger R/T. In fact, Davey does a bang up job of explaining exactly that here. We know it's a difficult choice. And we'll take either one in Statutory Grape Plum Crazy. Happy voting.